As spring marches its way into our lives bringing the much-needed lighter, brighter days, food starts to take on a lighter, brighter feel as well. Days can still be chilly so a perfect dish for this time of year is spring soups. This spring onion, pea and mint recipe is a perfect example of these changes as it takes on that lighter tone. The soup is perfect for not just Easter and spring lunches, as the recipe uses frozen peas, it can actually be eaten right through the year as long as you have fresh mint; dried simply will not do. In a large saucepan, gently heat the oil and butter until foaming, take care not to burn this. Finely chop the spring onions/scallions, green and white part. Add to the oil and butter and cook on a low heat for 10 minutes or until the onion is soft but not brown. Lower the heat and add the minced garlic and cook for a further 3 minutes, stirring. Again it is important not to brown the garlic as this could add a bitter taste to the soup. Add 3/4 of the frozen peas, 3/4 the chopped mint leaves and 3/4 stock. Cover the saucepan with a tight-fitting lid and cook on a medium, rolling boil for 10 minutes. 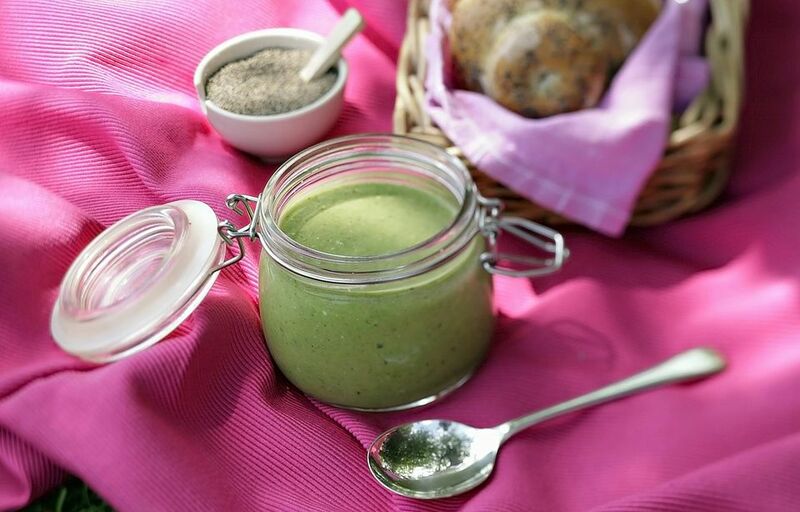 Blend the soup in a food processor or blender, you will have a thick puree. Return the puree to the pan, season with salt and pepper to taste. Finally, add the remaining frozen peas and stock. Cook for a further 5 minutes. Add the remaining chopped mint and stir. Serve the soup on warm soup plates with a swirl of the creme fraiche for added flavor if you are using. The soup is delicious hot, but equally, is delicious served cold, even well chilled on a hot summer's day. When serving chilled, serve in a glass. In the height of summer, if you have a supply of fresh peas, then use these. The flavor will be a little different and you may need to cook the soup a little longer than when using frozen. Otherwise, this recipe does not change. An alternative soup to using spring onions is this pea and mint soup.